NEW - I am now offering more variety in my workshops. Please scroll down to see NEW notice at the bottom of the page, and address for workshops. 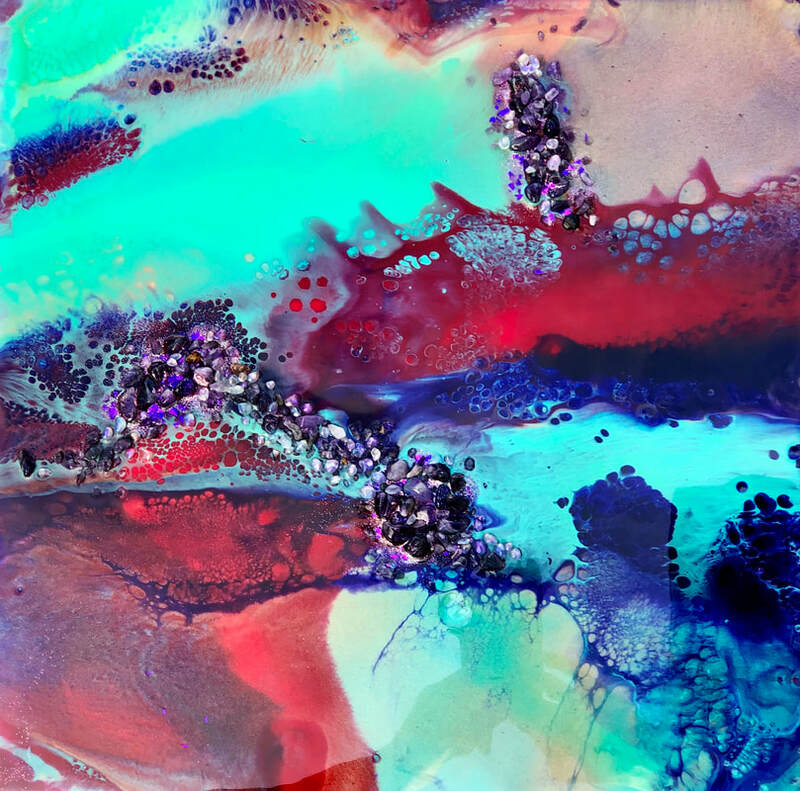 Would you like to learn to create your own beautiful Resin paintings. Book in for one of Gayle's Workshops to learn the techniques required to achieve beautiful artwork. ​ Check out Acrylic Pour Workshops on this link. Full payment must be made in advance prior to commencing the workshop. A deposit can be paid to book in, but the balance must be paid either by bank transfer beforehand, or cash before the workshop commences. Payment for participating in a workshop must be fully paid in advance, either in cash, or by bank transfer. I require a $50 deposit for each student attending, and the balance to be paid either before or on the day before the workshop. Please note: In each workshop, only one layer of Resin per student. If a student wants to add a further layer, then another workshop needs to be booked for each successive layer. 60cm round or 60 x 60cm square 9mm MDF will be supplied for workshop. Please nominate when booking in if round or square preferred. 80cm round (limited to 2 students per workshop). I will consider a rectangle of 60cm x 40cm if requested, but not larger. Please note: The substrates used in workshops do not have D-Rings supplied for hanging. Students will need to do this for themselves when they take their work home. Some students like to make their boards into a coffee table, other a lazy susan, and others want to hang their work. However I have made a YouTube video to demonstrate how I go about preparing the backs of my finished Resin artwork to get ready for hanging - see below. PLEASE NOTE: I do not do workshops with larger than 60cm or 80cm boards. Please be aware that larger substrates require substantially more Resin than the amount allocated per student, and increases the cost considerably as well as the degree of difficulty for the student. Larger works also take up more space, which can make working comfortably in a group of four or more students difficult. I will consider a rectangle of 60cm x 40cm if requested, but not larger. N0tice is required if you wish for a rectangle substrate. I have lots of coloured pigments or pastes for you to choose from, and design for your artwork is limited only by your imagination. A non-refundable deposit of $50 is required to book in, however date can be changed 2 days prior to workshop date if required. The balance to be paid before the commencement of the workshop. Book in by contacting Gayle on the contact form on this page. Payment can be made by Electronic Transfer, Pay Pal or Cash. DISCLAIMER: I cannot guarantee that you will create a "Masterpiece" in your first lesson. The objective of a workshop is to teach technique. However I will endeavour to give you, to the best of my ability, techniques to help you to achieve a beautiful result. After that - what you put in, is what you get. Practice, practice, practice is what is required. We all must put in the hard yards. Storm Surge - Multi Layer Resin Artwork, 90cm x 60cm. IMPORTANT NOTE: The minimum age for a resin workshop is 16 years. After trialing a class which included children, I have assessed that the handling of the messy chemicals, the handling of the butane torches and handling of heat guns makes it difficult to ensure safety for children. Not suitable for pregnant women, due to chemicals that are used. Late morning Resin Workshop 25th February 11:00am FULLY BOOKED. ​Contact Gayle on E: gayle@gaylereicheltart.com to join a scheduled workshop, or to arrange one on a different date. 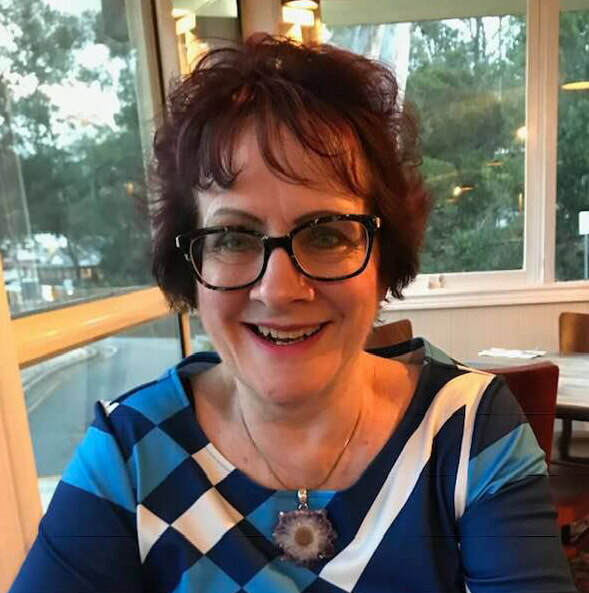 ​Gift Vouchers can be used for any of Gayle Reichelt's workshops, can be used for a private lesson or for purchasing a Gayle Reichelt painting. * What is needed to set up your own resin workspace. I do not supply D-Rings or wire for hanging your artwork. However I have made a YouTube demonstrating how I prepare the backs of my work for hanging. 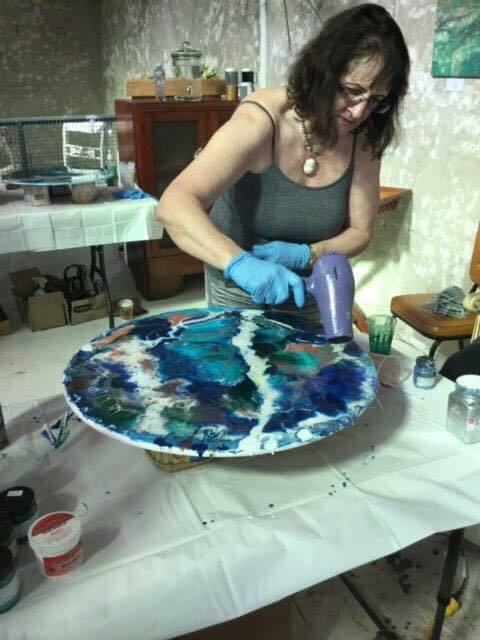 For a group of a minimum of six and up to ten students, Gayle will travel to your venue for a Resin workshop. Contact Gayle to enquire about the cost of Group Bookings. PREPARING THE BACKS OF YOUR ARTWORK FOR HANGING. A recent YouTube video with a Resin painting demonstration of "Valerie", by Gayle Reichelt. If you like my video, please five it the thumbs up and subscribe to my channel. Please share with any of your friends. Valerie. 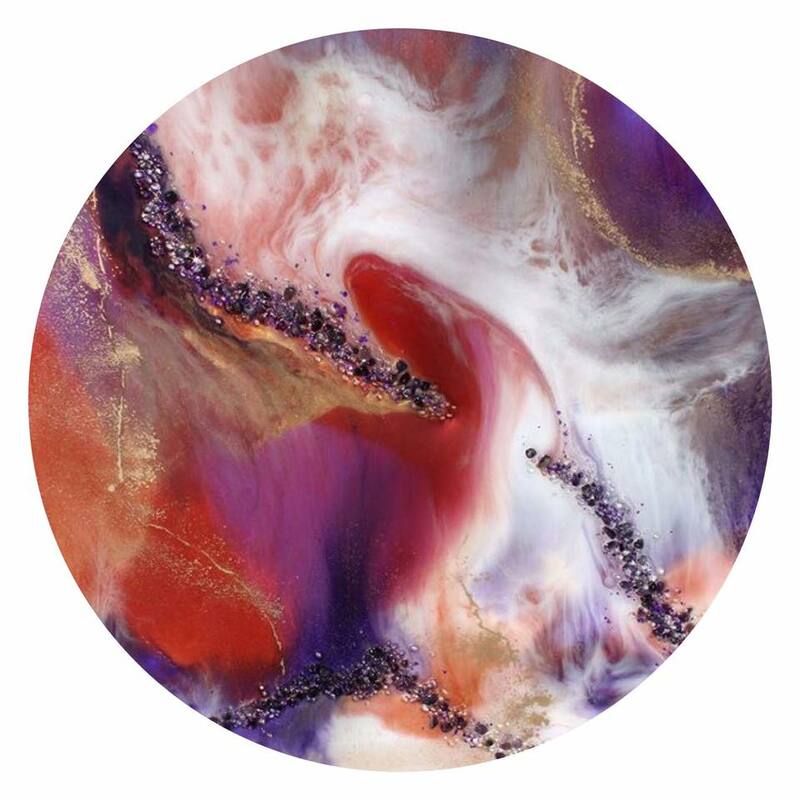 A 40cm x 40cm Resin with embedded Gemstones by Gayle Reichelt. Available for purchase. See video below for a typical group Resin Workshop set-up in a remote location, and some students at work. Air Conditioned studio. BYO own lunch if required. Tea or Coffee available. After the Rail. 60cm x 60cm Resin Artwork. WILL RESIN ADHERE TO ENCAUSTIC? Gayle has a BA Hons in Fine Art, and a Grad. Dip Ed (Art Method) from La Trobe University in Bendigo, Victoria. She is a member of RQAS and the Australian Society of Marine Artists, and is an Accredited Member of Flying Arts Alliance Inc.
Video of my demonstration painting at a workshop on July 8th during my Universe Unfolding Exhibition.